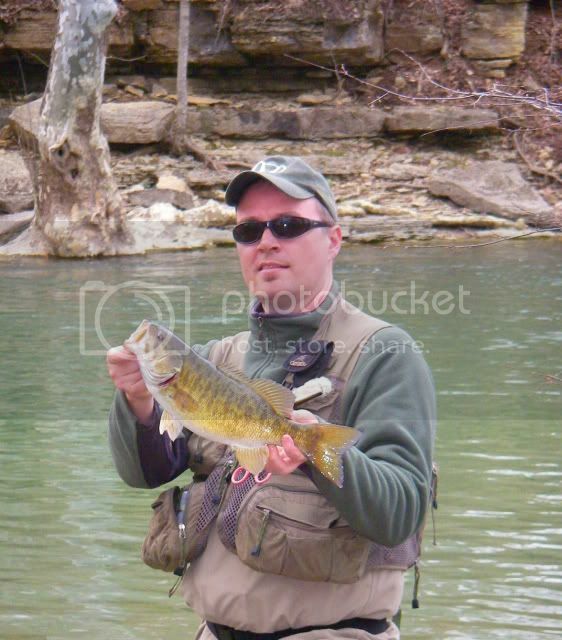 Jim F and I went out for the wade we've been talking about all winter. Actually, more a Nascar race around a large circular pool with huge boulders, a cliff wall and several stepped shelves which the creek spilled down through. Some of the deepest water I've fished in a creek. The sun was out and the water was green! Vis to 2-3 feet and the water warmed up to 50F as the air got to 65 during the day! Finally! I imediately thought: "shiny jerkbait". I threw on a LC Pointer 100 in Misty Shad, first cast a 15"er hit the bait. Jim was working from the riffle shelf down the deep side of the pool with FnF. I caught two more on the Pointer 100 on the pause. Surprised a 10" would hit the pointer 100. Moved over to fish the deep current cut bolders on Jim's side of the stream. Jim was getting bit on a small worm and soon had a nice 18"er to hand! I pulled free my tube from a 16-17"er who never had the hook in flesh. We started to circle the pool I got three SMB on a venom Watermelon black pepper/red flake tube with 3/16th oz jighead hopped along the slacker water. Most of these fish were thin. They meakly tried going airborne to prevent my unhooking them. These fish were under the main current sitting at the bottom of some rock shelves my 3/16th oz tube was tumbling past them just right. We left the smaller and hit the larger river. :) Did I say I love this river? When you aren't catching SMB you can marvel at the geology. Too bad its so far away , over 2 hours of driving today round trip. I got three fish on the Pointer 100 12, 14.5, and 16". The 12"er had come from some crazy current. Jim and I hit a large flat ona bend near some current with bigtime drop off. I nailed a 16"er on tube then this 17.5 on the next toss, right as I was about to pull it out of the water. Ended up with 6 fish off that spot 16, 17.5, 15.75, 16, 15.5, 17", all on tubes. These fish were all very fat and fought like [b]crazy[/b]. 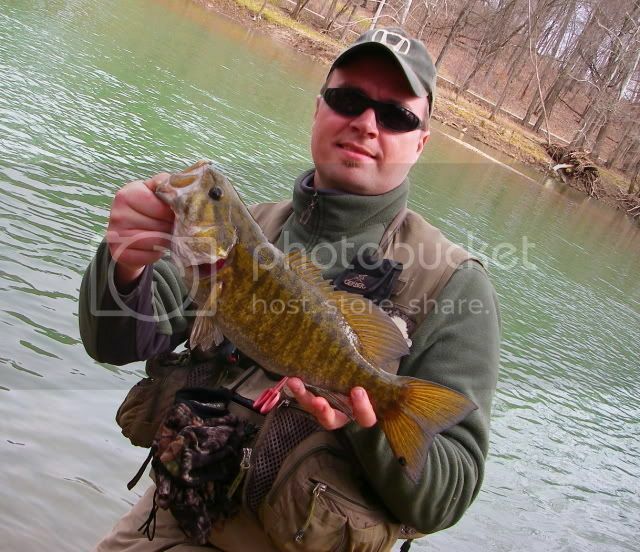 I had forgotten how BA Smallmouth can be over the winter. They were smacking the tubes with authority and fighting like the wanted my rod out of my hands. We headed back and Jim went off into the woods and caught a couple dinks and a 17". Poor guy had problems with his line snapping all day on casts. Jim was also tossing a lighter tube. BUT he had big bass! BT 17 SMB (17.5, 2 17,3 16, 4 15") 6 Pointer 100 11 tube. 0 FnF bites. Jim 6 (18, 17") We fished 6-7 hours. Good company and absolute blast. 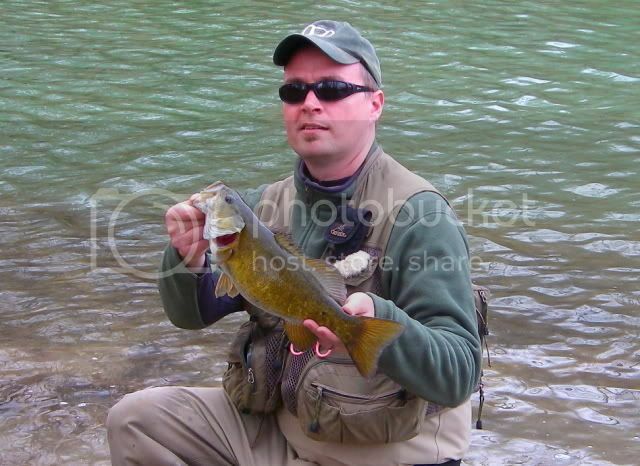 It really was great fun to feel that twang of a large fish nailing a tube again. The fight on these fish is just unheard of.